Just this week, Treyarch revealed a new game mode for it's upcoming Call of Duty: Black Ops title. A new game type, dubbed 'Wager match' will allow players to bet in game currency with fellow gamers. The top three players will take home the dough, while the rest will be left with nothing. 'One in the Chamber' - Player's start with a pistol that contains only one bullet. If they kill someone, they pick up their bullet. If they miss, they will be left with only the melee option as a way to kill their opponents. 'Sticks and Stones' - Players will be equipped with the crossbow weapon, ballistic knives, and tomahawk. If they are killed by a knife, they will be bankrupted. 'Gun Game' - Players start with a basic weapon and are given a more powerful gun every time they get a kill. If the player is killed, they will be bumped back one weapon in the cycle. The first player to reach the final weapon in the cycle wins. 'Sharp Shooter' - Players will all start with the same randomly assigned weapon. Weapons will automatically cycle through randomly for all the players after a certain set amount of time. These new game modes should add a new element to Black Ops which has not been present in any Call of Duty series game in the past. The Wager Match mode will surely keep people on the edge of their seats as there will always be something on the line. Its been a busy past few weeks. I haven't found much time for gaming as of recently. Although I am occasionally on FIFA World Cup South Africa 2010. I'll be waiting until the end of this month for FIFA 11 (September 28th in the US). Other than that, not much to report on. My old Xbox 360 has left, and I have about a hundred or so dollars to show for it. I will probably be putting that down toward my Kinect pre-order later this week. There isn't too much else going on at the moment, possibly some new info on Call of Duty Black Ops or FIFA 11 to come later this week. Following last week's Gamescom event, David Rutter of the FIFA production team answered questions from Facebook users regarding the upcoming EA Sports title, FIFA 11. The demo is due September 16th for both the Xbox Marketplace and Playstation Store. Rutter has mentioned that there will be a few surprises in the demo, and chose to not reveal the demo teams in the interview. FIFA 11 is due to be released on September 28th in North America and on October 1st in Europe/Asia. Personality+ engine in which players are true to their real life characteristics. This means an aggressive defensive midfielder such as Gattuso will be a tough competitor on 50/50 balls and slide tackle with much more intent as opposed to someone who is not known for his defensive skills, such as Nani. Even referee's will have their own personality traits, which affect how leniently or strictly they referee the game. Player faces have been remodeled and updated. Although Rutter didn't specifically mention which teams and players were updated, it is a safe to say that most big name clubs and players have had their facial look and personality traits modeled according to their real life characteristics in FIFA 11. Users can now control the Goalkeeper, which will allow full on 11v11 online club gameplay. Goalkeepers can also be chosen as the user's individual player in Career mode. The goalkeeper's position can be controlled by using the left stick, while diving is initiated with the right stick (similar to the way the keeper has been controlled in penalty kicks). For those of you who don't feel up to the task, a simple press of the 'X' button will allow the keeper to make an assisted save. If you are playing with a friend, one of you can control the goalkeeper in the loading arena, allowing for fun 1v1 gameplay. A new 360 degree gameplay system which allows players to jostle and fight for the ball in a dynamic new way. Manager mode and Be a Pro mode have both been scrapped, er or um, combined in a new 'Career Mode'. Career mode allows players to choose a single player (or your virtual pro) and control him over the course of 15 seasons. Users can also decide to partake in a combined player-manager role or just a manager. The penalty kick system from FIFA: World Cup 2010 will be returning for FIFA 11. No new national teams will be added from FIFA 10's crop, but the Russian Premier League will be making it's debut on the 'next-gen' versions of FIFA. Virtual Pro's cannot be transferred over from FIFA 10, so you will have to start from scratch. The number of VP accomplishments has been doubled to about 400. New Virtual Pro unlock items and traits have also been added. The online clubs system has been improved, allowing for better recruiting and scouting of fellow Virtual Pro's, including a 'trial' option which allows you to bring another user's Virtual Pro over to play a practice match with your club before deciding to bring him on. A truly impressive list I must say. I will be pre-ordering my copy of FIFA 11 this week. If anyone wants to play a quick game on FIFA 10 or FIFA: WC 2010, send me a message (my gamertag is on the right hand side of the page). Parting ways with an old friend. It will be a sad farewell for my trusty ol' Xbox 360 Pro. After 5 long years, a time away at the RROD intensive care treatment room, and hours upon hours of playing time later, it's time to let her go. Yes, sad times for all of us involved, but fear not, I will be looking forward to the Xbox 360 S 250GB and the wonderful world of Kinect. In the mean time, it looks like I have my eyes set on pre-ordering the following during my next trip to GameStop. Call of Duty Black Ops Multiplayer Teaser Trailer! There was a big buzz of excitement among gamers as the new Call of Duty Black Ops Multiplayer teaser trailer made it's way onto the official Call of Duty Black Ops website. While playing Modern Warfare Two, word of the trailer spread like a wild fire in every multiplayer lobby I joined. It looks like Treyarch will be adding a few new elements to the game such as new rewards for kill streaks, among which include a remote controlled RC car bomb and a spy camera which replaces the player's radar on the upper left hand portion of the HUD. It also looks like Black Ops will be taking a page out of Halo's book by adding a theater-like replay function that allows you to record, save, upload, and share gameplay footage with friends. Through my time playing both on Live and browsing discussion boards, it seems that most casual Xbox 360 owners are not aware of the ability to install games onto their Xbox 360 hard drive. The benefits of installing a game onto the hard drive are immense. For those of you who have the room to spare, 60GB-250GB owners, installing games onto the hard drive is a must. 20GB owners may be able to allocate enough room to install one or two of the games they play the most. Some games receive a significant performance boost, including smoother gameplay, faster loading, and less frame rate stuttering. The greater benefit though, applies to all games, as once a game has been installed onto the hard drive, the Xbox 360 will run at almost dashboard level quietness. The disc drive will no longer have to spin, which will save the system from generating extra heat from having to read the disc while playing, as well as save electricity and create a quieter gaming environment. 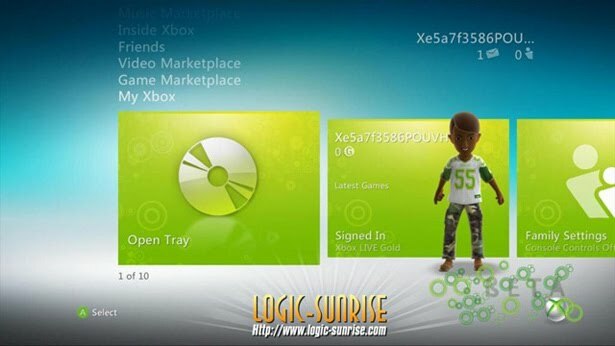 Before you start hot swapping discs, remember that the actual game disc still needs to be inside of the Xbox 360 for the game to play. 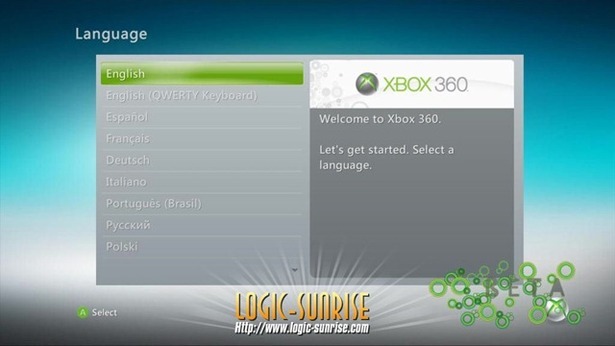 Make sure the game disc you want to install is inside the Xbox 360 and has been recognized (readable). 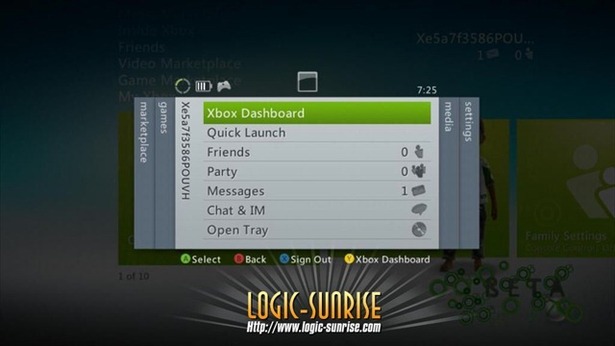 Go to the 'dashboard' on your Xbox 360. Make sure you are in the 'My Xbox' pane. Scroll to the right and press 'A' on the 'Game Library' menu. Highlight the game that is currently inside of your 360's disc drive and press 'A'. Choose the 'Install to hard drive' option and let the system do it's work. The installation should take about 5-10 minutes. Once the installation has finished, you are good to go. Hope you enjoy the peace and quiet. 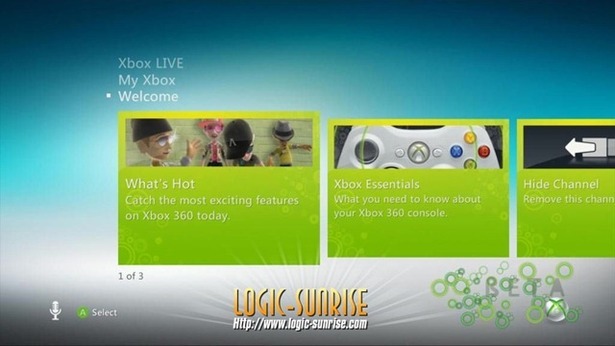 Recent screenshots have surfaced on the internet from the French website Logic-Sunrise.com which show new possible images for an upcoming dashboard update for the Xbox 360. The new update is designed to integrate the Kinect accessory into the dashboard (although referred to as NATAL in these early developmental screenshots). 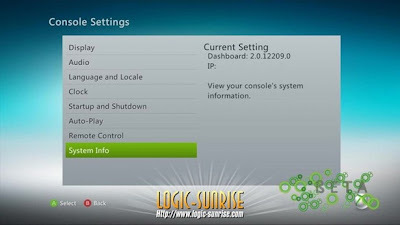 Among the other changes are a vertical orientation between selectable items on the dashboard, a newer sleek theme that surrounds menu options and the guide button menu, plus added options to the system settings menu. This new dashboard update will surely be a part of Microsoft's fall system update which should arrive before Kinect's launch date of November 4th. 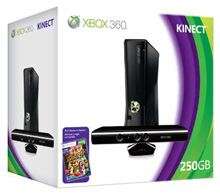 The Xbox 360 S 250GB Console Bundle ... Reviewed! Just about a month ago, Microsoft made a big splash in the water by releasing the new, redesigned, 'slim' version of the Xbox 360. 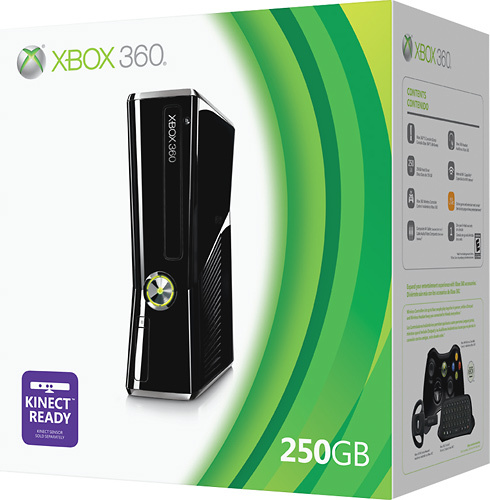 The new console, dubbed the Xbox 360 S, is sold with WiFi compatibility built in and includes a 250GB hard drive. The Xbox 360 S also takes on a new appearance, sporting a sleeker form factor that includes a slight redesign of the physical appearance system itself, while maintaining the same basic shape of the original Xbox 360. Many current 360 owners will ask themselves, "Is it time for an upgrade?"... "Is it worth it to upgrade?"... "Yes, no, maybe so...". First off, considering how the new Xbox 360 S sizes up against the original Xbox 360, there is really not much of a true physical difference. While it's definitely no Playstation 2 turned slim transformation, the new Xbox 360 S manages to cut about an inch and a half of height, a sliver of width, and actually increase a third of an inch in depth. Microsoft also decided to cut down the weight from 7.7 pounds on the original to 6.3 pounds on the new redesigned Xbox 360 S. The actual physical resemblance between the two systems is very clear, although the newer 360 S takes on a slimming and more futuristic look. 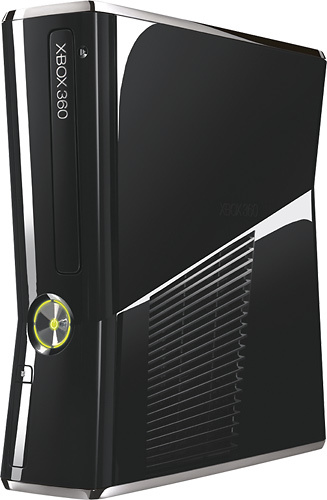 The Xbox 360 S sports all of the same cable connections as on the original system, while also adding an optical audio jack, a dedicated kinect port, and a redesigned hard drive bay. With memory cards entering the final waning days of their lives on the 360, Microsoft decided to ditch the mem-card ports in place of two extra USB sockets. Interactive buttons on the front of the system, such as the DVD tray eject button have been made capacitive (touch sensitive). Overall, the system does make slight improvements physically speaking, although there is nothing that really goes as far as to stand out. 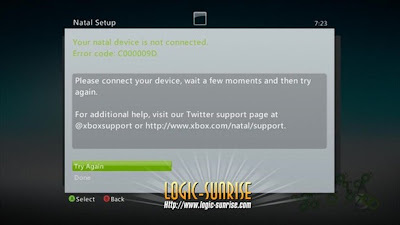 The most useful addition to the 360 S is the built in 802.11n WiFi connection, which allows for downloading and online gaming on par with a direct Ethernet connection. The hardware, although slightly updated, does not make any noticable improvements on processing speed (loading or installing games). Fortunately, the 360 S redeems itself by acting as a more efficient incarnation of it's older brother. 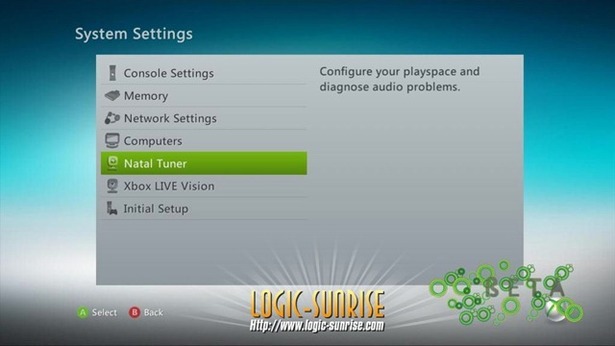 Tests have shown that the redesigned system uses a third less power when playing and installing games or watching DVDs, and close to nothing when sitting idle at the dashboard. The 360 S is also stealthy quiet compared to even the newer Xbox 360 Elite systems, it hardly makes a whisper when playing games that have been installed onto the hard drive. Unfortunately, it still manages to act as a makeshift space heater when left on for long periods of intense gaming. So is the new Xbox 360 S truly worth getting? For first time Xbox 360 buyers, the answer would be a definite yes. With many new games coming out this fall that are sure to make a splash, as well as the built in Kinect compatibility, it is hard to overlook such a powerful system. For current 360 owners looking to upgrade, the question is a bit more debatable. Most Xbox 360 owners will be satisfied with their 120GB hard drives for now, and a system redesign alone doesn't hold much weight in the eyes of most casual gamers. Sure it may be quieter and use less power, but those perks alone are most likely not enough for the current 360 owner to make the splash, unless you are own a Xbox 360 arcade or 20GB Pro and are looking to make the step up, or just have deep pockets. Fortunately, for those current owners who are interested, there is are ways to get the 360 S for less. A 'old' 20GB system complete with cables and a game or two (something you don't really play anymore) can be sold for $150 on eBay. You can even try asking if any of your friends are interested in the system, possibly through a social networking site, or even post it on craigslist (to avoid eBay's fees). Couple that nice return with an online retailer who is running a free shipping promotion and you pick up the Xbox 360 S for $299 flat. Not too shabby I'd say, but I'll be sticking with my trusty 120GB system for now, but I can't say I don't see a possible upgrade in the near future. Medal of Honor Beta for Xbox 360 is live! Well folks, it looks like EA was finally able to get the Medal of Honor beta online for Xbox 360 users this past Friday. Gamers who had already pre-ordered the game through GameStop will have received a hard copy of the code upon checkout or through an email (for those who pre-ordered online). When starting up the beta for the first time, you will notice two available game types, Team-Assault and Mission. The Team-Assault game mode is essentially a team death match with a few interesting differences. The winning team is decided by reaching an overall score total, which in this case is 1200 points. The scoring system gives a base of 10 points for each kill, plus an additional 5 for a head shot, melee, and or redemption or savior kill (of a teammate). These bonuses add up quickly, making it possible for a team to win the match while having less overall kills than their opponents. Many Battlefield Bad Company veterans will recognize the Mission game type as having great similarities to the Rush game mode on BFBC and BFBC2. Attackers try to destroy a certain objective in the map, if they are successful in doing so, a new objective will appear and players advance to a new point further along in the map. There are a total of five objectives to destroy in the Mission game type on the beta. Defenders must stop the attacking team from destroying the objective by withering away the opponents ticket count, which when reaches zero, equates to a victory. The game play is essentially a hybrid between the Call of Duty: Modern Warfare series and Battlefield: Bad Company 2. The game is produced by DICE and EA, using the frostbite engine, leaning closer to the Battlefield series in terms of game design and weapon feel, while maintaining a fast pace and rewarding "point streak" rewards give it a resemblance to Call of Duty. Bullet damage seems to resemble BFBC2 more closely than in the Call of Duty series. Head shots on the MOH are deadly, let me repeat that deadly, because chances are if you don't head shot the other player in a firefight, you will likely be seeing the respawn screen. Although the hit detection system is still a bit flawed, and it is frustrating to deal with the 'delayed deaths', the beta still does a good job of finding a niche in the balance between the two FPS games. The frostbite engine combined with DICE's game developers have led to the creation of 'Call of Duty sized maps" with BFBC2 style texture and environment design. The beta maps are relatively well designed, providing a good balance for both teams. Users can choose between three pre-determined soldier classes, Rifleman, Special Ops, and Recon. Players start out with a limited ability to customize their equipment, but as they progress by earning points with the respective class, unlocks such as combat scopes, silencers, muzzle brakes, extended magazines, and open-tip ammunition become available. Players rank up their own skill level separately from kit classes. The player ranking system is based on a 'skill level' which changes depending on the dynamic performance of the player in ranked games. Posting a 40-5 kill death ratio in a lobby filled with lower leveled opponents (in comparison to your own) will only net you a 10 point bonus on your overall skill level. Yet placing mid table in a lobby filled with players way above you in terms of skill level can net you a large bonus. For anyone who has yet to try out the beta, I highly recommend giving it a shot. It may not be the most ground-breaking FPS to hit the 360 scene, but it sure is a nice change of pace from the usual MW2 or Bad Company. For those who would like to catch a game with me before the beta runs it's course, my gamertag is listed in the right hand column of the page. Amazon is running a good deal for those who order through their website, saving you some money by providing free shipping.